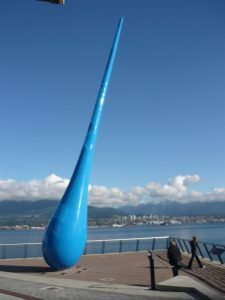 The Drop is a towering, 20-metre, outdoor sculpture located at the Bon Voyage Plaza next to the east side of the Vancouver Convention Centre. 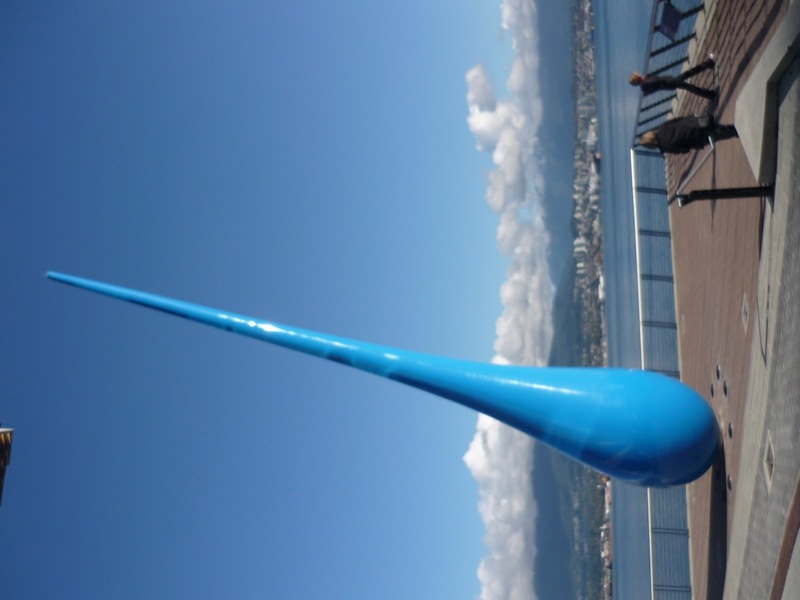 Sculpted by the German artist collective Inges Idee and installed in 2009, this raindrop-shaped art piece showcases the importance of water as a natural resource. There’s no denying that sometimes, some of us think that the frequent Vancouver rainy days are annoying. Yes, it’s true that the rain can be bothersome when you step in a large puddle of water during a heavy downpour. Yes, it’s equally true that those water droplets from the sky can be an inconvenience when you get drenched because you forgot your umbrella at home. If the precipitation evokes a sense of unbearable annoyance in you, I suggest taking a walk along the Bon Voyage Plaza to admire The Drop, whereby you can take a moment to remember the privilege we have from experiencing the rainy Vancouver days. Every summer, many of us Vancouverites complain about the hot, long, humid summer days and nights. Every summer, we also moan about the forest fires that turn our province into a raging inferno. Moreover, we can hardly enjoy a nice, brisk, summery walk or jog. Outdoor exercise enthusiasts sometimes opt to stay indoors during the summer to do some indoor jogging. To these joggers I say: Travel down to the east side of the Vancouver Convention Centre to admire The Drop as a reminder about the joy of getting touched by a light rain drizzle. These light showers may help you to feel cool during the scorching summer days and during your outdoor workouts. While you observe The Drop, take a moment to reflect on the privilege that we have of being surrounded by the water from the Burrard Inlet and the mighty Fraser River. We are quite fortunate to have these large sources of water in the event that there is a water shortage. Hopefully, there won’t be a battle for water. Hopefully, we won’t experience living in the waterless, apocalyptic, dystopian world that is depicted in several films and TV shows. Before such a scenario occurs, art pieces such as The Drop will inspire us to protect these large bodies of water. Take another moment to marvel at The Drop and think about the effects of water pollution. When there’s water pollution, we probably won’t be able to enjoy a cool, refreshing glass of water straight from the tap. We most likely won’t be able to wash our clothes, our hair, or ourselves nearly as easily as we do now. When you view The Drop, take an extra second to ultimately remember the beauty, importance, and power of water.